Russian President Vladimir Putin congratulated the Russians on the Day of National Unity. 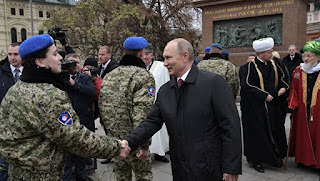 "I congratulate all of you and all the citizens of the Russian Federation on the holiday - on the Day of National Unity," Putin said at the ceremony of presenting the state awards in the Kremlin. He thanked all those awarded for their special attitude towards Russia, for their love of the Russian language, history and culture. The Day of National Unity is celebrated annually on November 4, beginning in 2005. The festive date appeared in the Russian Federation in memory of the events of 1612, when the people's militia led by Kuzma Minin and Dmitry Pozharsky liberated Moscow from the Polish interventionists. Historically, this holiday is associated with the end of the Time of Troubles in Russia in the 17th century. Earlier on this day, the head of state attended the wreath-laying ceremony for the monument to Minin and Pozharsky, and also visited the exhibition.